51:0.3 Although you cannot hope to know all about the work of these Sons on all the worlds of Satania and other systems, other papers depict more fully the life and experiences of the interesting pair, Adam and Eve, who came from the corps of the biologic uplifters of Jerusem to upstep the Urantia races. While there was a miscarriage of the ideal plans for improving your native races, still, Adam’s mission was not in vain; Urantia has profited immeasurably from the gift of Adam and Eve, and among their fellows and in the councils on high their work is not reckoned as a total loss. 51:3.5 The fifth order of angels the planetary helpers, are attached to the Adamic mission, always accompanying the Planetary Adams on their world adventures. The corps of initial assignment is usually about one hundred thousand. When the work of the Urantia Adam and Eve was prematurely launched, when they departed from the ordained plan, it was one of the seraphic Voices of the Garden who remonstrated with them concerning their reprehensible conduct. And your narrative of this occurrence well illustrates the manner in which your planetary traditions have tended to ascribe everything supernatural to the Lord God. Because of this, Urantians have often become confused concerning the nature of the Universal Father since the words and acts of all his associates and subordinates have been so generally attributed to him. In the case of Adam and Eve, the angel of the Garden was none other than the chief of the planetary helpers then on duty. This seraphim, Solonia, proclaimed the miscarriage of the divine plan and requisitioned the return of the Melchizedek receivers to Urantia. 51:3.9 Your world has been visited by four orders of sonship: Caligastia, the Planetary Prince; Adam and Eve of the Material Sons of God; Machiventa Melchizedek, the “sage of Salem” in the days of Abraham; and Christ Michael, who came as the Paradise bestowal Son. How much more effective and beautiful it would have been had Michael, the supreme ruler of the universe of Nebadon, been welcomed to your world by a loyal and efficient Planetary Prince and a devoted and successful Material Son, both of whom could have done so much to enhance the lifework and mission of the bestowal Son! 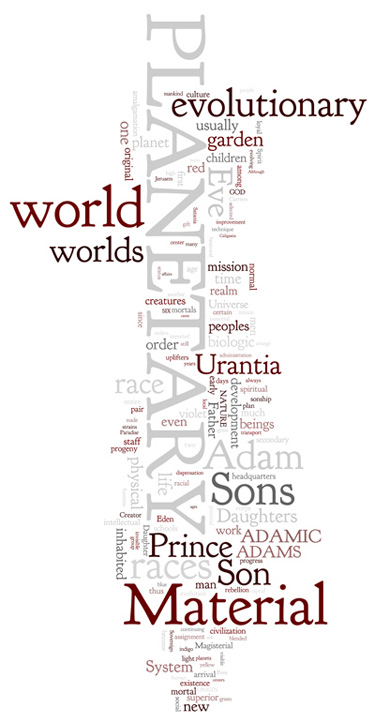 But not all worlds have been so unfortunate as Urantia, neither has the mission of the Planetary Adams always been so difficult or so hazardous. When they are successful, they contribute to the development of a great people, continuing as the visible heads of planetary affairs even far into the age when such a world is settled in light and life. 51:4.3 On those worlds having all six evolutionary races the superior peoples are the first, third, and fifth races—the red, the yellow, and the blue. The evolutionary races thus alternate in capacity for intellectual growth and spiritual development, the second, fourth, and sixth being somewhat less endowed. These secondary races are the peoples that are missing on certain worlds; they are the ones that have been exterminated on many others. It is a misfortune on Urantia that you so largely lost your superior blue men, except as they persist in your amalgamated “white race.” The loss of your orange and green stocks is not of such serious concern. 51:5.3 On normal worlds the Planetary Adam and Eve never mate with the evolutionary races. This work of biologic betterment is a function of the Adamic progeny. But these Adamites do not go out among the races; the prince’s staff bring to the Garden of Eden the superior men and women for voluntary mating with the Adamic offspring. And on most worlds it is considered the highest honor to be selected as a candidate for mating with the sons and daughters of the garden.